To evaluate demographic and radiographic features that may differentiate between enchondroma and low-grade chondrosarcoma of the fibula. The radiographs of ninety-three histologically-confirmed cartilaginous tumors of the fibula were retrospectively reviewed along with demographic information as to patient age and gender. Fifty-four enchondromas and thirty-nine low-grade chondrosarcomas were included in the study. 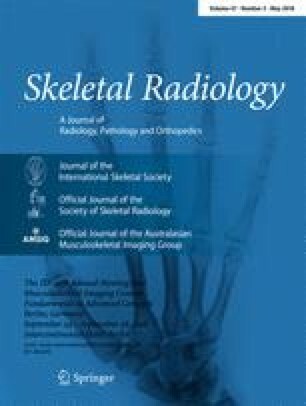 Multiple previously-established radiographic features distinguishing enchondroma from chondrosarcoma were evaluated in each fibular tumor in a consensus manner by two experienced, board-certified and fellowship-trained musculoskeletal radiologists. Five radiographic features were shown to statistically favor chondrosarcoma over enchondroma in the fibula. These were soft-tissue mass (p<0.0001), periosteal reaction (p=0.008), cortical disruption in the juxta-articular fibula (p=0.0133), cortical thickening (p=0.032), and tumor size greater than 4 cm (p=0.0046). No statistically-significant demographic differences were found between patients with enchondroma and chondrosarcoma of the fibula. When two or more of the identified features of malignancy are identified in the same patient, chondrosarcoma is 2.4 times more likely than in those patients exhibiting none of the features of malignancy. Soft-tissue mass, periosteal reaction, cortical disruption in the juxta-articular fibula, cortical thickening, and tumor size greater than 4 cm indicate chondrosarcoma over enchondroma of the fibula. Radiographs demonstrating more than one of the identified malignant features are more likely to be due to chondrosarcoma than radiographs demonstrating none or only one of the identified features. No unique malignant features of chondrosarcoma in the fibula were observed when compared to previous descriptions of these tumors in the long and short tubular bones of the appendicular skeleton.